Various Artists - Spiritual Jazz 8: Japan, Pt. 2. Vinyl LP. Bleep. 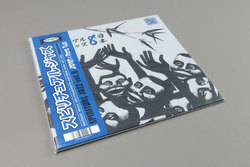 Round two in this new Jazzman series of spiritual, modal and progressive jazz from 20th century Japan. As if volume 1 wasn’t enough, Gerald and his cohorts gift us with another eight compositions from their incredible archives. Yet again we have sweet, doe-eyed cover versions (‘Scarborough Fair’) rubbing shoulders with original compositions including Takeo Moriyama’s unbelievably mellow ‘Watarase’ - the kind of tune that you want to stick on the turntable first thing in the morning while brewing your coffee. Closing cut ‘Whispering Weeds’ is an aural assault of sheer ecstasy, give it time!